The actual experience of driving a car can be far from the Hot Wheels-inspired fever dreams and high-octane Formula 1 thrills that we might have imagined when we were young, what with road tax, MOTs and scrubbing bird poo off the windscreen on a Saturday afternoon being much closer to reality. But with all the great racing games on the scene right now, there are more ways than ever before to live that dream, at least digitally. And, whether you’re on PC, PS4 or Xbox, our list of the best driving games transcends all boundaries (well, except Mac – sorry). Animators have obviously been busily beavering away over the past few years, because the racing games that 2016 and 2017 have produced are nothing short of beautiful. How amazing is it that game graphics can now accurately capture the freedom of driving under a huge blue sky or the sun glinting off the hood of a supercar? But while we sort of expect stunning visuals above all else in racing-based entertainment (hey, The Fast and the Furious was never going to be Citizen Kane, was it?) these games also pack some surprising depth. Of course, if you want a few hours of unrelenting carnage – driving off cliffs, shunting other competitors off the track, ridiculous aerial acrobatics, you know the drill – you can get it in abundance in the titles in our list, but it’s also so much more than that. Offering loads of customisation, new and improved career modes, multiplayer games galore, and more besides, prepare to sink hours into these titles. Compared to its maverick cousin Horizon 3, below, Forza Motorsport presents the player with a pretty straightforward sim racing experience, but it’s also the best racing game out there. For one, it looks absolutely phenomenal, with dynamic weather and realistic lighting. For two, nothing rivals it, on any platform, for the sheer number of cars you can collect, from swoon-worthy supercars to utility vehicles. In terms of gameplay, reviewers found it didn’t depart too much from its predecessor, although the more structured career mode has been a welcome change. Overall, it’s undoubtedly worth trading up to, maintaining Forza Motorsport’s reputation as the best racing game series around, accessible for beginners but with enough to keep certified car obsessives happy too. In the market for a proper racing sim? GT is still the GOAT. For anyone who’s worked their way through the GT series ever since the original title skidded onto screens in 1997, GT Sport may well be the culmination of everything good that’s come before it. While it hasn’t taken too many huge leaps forward, the evolution has happened where it counts: the same great handling and responsiveness is there, as it’s always been, but the AI is way more advanced, the races are more thrilling, and the options for curating an enjoyable driving experience are more varied than ever before. Where it might be accused of falling down, compared with FM7, is in its looks, but for a superb simulation, why go anywhere else? The developers of Forza Horizon have done an incredible thing, and that’s create a game that’s every bit as enjoyable for people who know nothing about cars as it is for dedicated petrolheads. Want to just get started straight out of the box? That’s fine. Want to make any number of infinitesimal changes before you race? That’s fine too. Number 3 in the Horizon series finds us in Australia, and mimics the scale and unpredictability of the landscape in glorious style, allowing you to explore everything from sandy beaches to the desolate outback and dense rainforests, all on four wheels, and huge map (double the size of Horizon 2’s) plus totally free rein over your own events, gives a sense of freedom that you won’t find anywhere else. Rally fans can get their muddy, noisy kicks in superb style with this realistic racing game from Codemasters, the same studio that brought us F1 2017 (below). Suitably high-octane and high-stakes, it’s not an easy game by any stretch of the imagination, but the satisfaction of pulling off that perfect handbrake turn or missing a rapidly looming tree by just a whisker with a masterfully timed slide is indescribable. There are no sent-from-the-heavens blue turtle shells to wing you into first place in this unforgiving mudfest, and practically no margin for error, but DiRT Rally’s intuitive and responsive controls and varied course conditions reward practice and skill, and in time, the results will start to show for themselves, which is better than an easy victory any day – well, most days. In a brief departure from games which have perfected life on four virtual wheels, our list takes a turn for the slightly bonkers with the amazing Trials Fusion. This motorbike-based game is more of an exercise in understanding the physics of showboating than it is a racer in the strictest sense, and trying your hand at its visually stunning but occasionally fiendish stages will take you on the same rollercoaster of dizzying elation and overwhelming despair that you get from watching a fluffed landing on Total Wipeout. Don’t let that put you off though. Like DiRT Rally, the highs inherent in nailing elements of such a tricky game are incredible, and it sits just on the right side of frustrating (the fun side, that is) to keep you wanting to try again and again. The best Formula 1 racing game to date, F1 2017 packs a real punch both on the tarmac and off it with superb in-race and career experiences. This time, it’s not all about the speed which, while it might sound counterintuitive, is a sensible change, adding a new layer of consideration to each race. Less speed might mean more durability and cut the risk of devastating engine failure, or it might cost you big, and it’s this level of strategy, not to mention the tons of extra depth added to the career mode, that sets F1 2017 apart from the competition. Don’t have time to see a whole career through? The new Championships mode will see you right, letting you just jump in and do your thing on a whim much like an arcade racing game. All in all, superbly balanced, and the best title in the series so far. Come on, did you really expect us to make a list of the best racers without a nod to Mario Kart? This Nintendo Switch racing game looks great both on the handheld console’s small screen and beamed to the TV, where its already sharp and colourful graphics get an upgrade to 1080p and 60fps, but it goes without saying that it goes huge on the content too. While previous players might feel short-changed by a repackaged Wii U release, there’s new content, the return of the frenzied 200cc tournaments, and an arguably best-in-series Battle Mode missing from the previous Mario Kart 8 that will all entice even jaded long-time players into hours upon hours of play. Plus, that Battle Mode is really what it’s all about, featuring five modes that make this easily the most sociable multiplayer racing game ever. Project Cars 2 is exactly what a good video game sequel should be. The changes it makes from the original are so much for the better that you won’t want to look back, including far superior handling whether you’re on a wheel controller or gamepad, an expanded selection of cars, and a tangibly higher level of accessibility for beginner players. 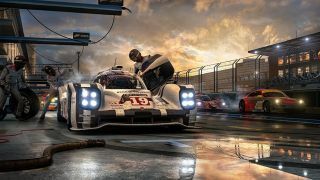 Like Forza Motorsport 7, there’s enough detail and adjustment available to keep people who are really into their cars interested, but elements like the excellent voice-over walking through each aspect of the game (courtesy of Top Gear’s former Stig, no less) and clearer, more in-depth explanation of the impact various setting changes will have on the feel of the game, mean it’s not intimidating with it. Been waiting for the loop-the-loops? Here they are. If you were into Hot Wheels as a kid – let’s be honest, of course you were – Trackmania Turbo will be right up your street, with insane stages, more twist and turns than you can shake a (gear)stick at, and loads of heart-stopping, gravity-defying stunts. It’s fast, it’s fun, it’s possibly more reminiscent of Crash Nitro Kart than a more traditional racing game, and above all, it’s addictive stuff. Eternally promising yourself just one more restart to beat a dissatisfying personal best, you’ll find yourself zipping through a world of absorbing solo and multiplayer gameplay, broken up into beautifully animated and surreal tracks, and that’s the real beauty of the game summed up: it’s really easy to start, but surprisingly, deep enough that you won’t be able to stop. Hey, those delicious graphics need somewhere to go! Check out our list of the best TVs for gaming to make the most of them.